The National Trust has embarked on an ambitious conservation project at Castle Ward, Strangford, County Down, which will see a refurbishment of the Temple and the restoration of historic paths and vista points. 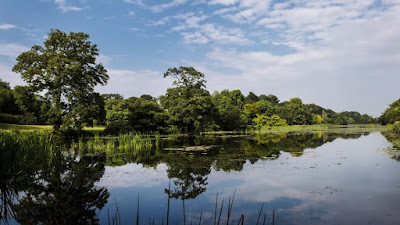 The man-made landscape of the Temple Water area, conceived by the Wards, Viscounts Bangor, is one of the most important late 17th and early 18th century gardens to survive in Northern Ireland. Over the years the design of the landscape has become obscured by self-seeded trees, poor drainage and other changes. As a conservation charity we are committed to protecting our special places for ever, for everyone and so we are restoring this hidden part of Castle Ward to enhance visitor enjoyment and understanding of the area. We anticipate the project will take three years and will include the repair of the Temple and improvements to the parkland that will open up views of both Audley’s Castle and Strangford Lough. 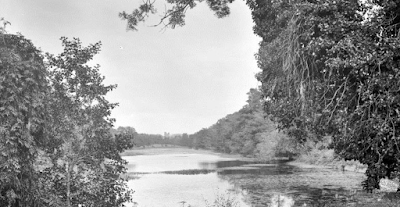 The lake at Castle Ward, known as Temple Water, will be central to the restoration project. Features planned for restoration include the crumbling stone sides of the Temple Water which have been weakened by tree roots over the years. The Temple will also be refurbished and the original paths will be reinstated, creating a picturesque route around the Temple with spectacular viewpoints. Historic paths will be reinstated along Lime Tree Walk and visitors will be able to grace the reinstated historic steps on the Yew Tree Terraces. The viewing mound and early 18th century Ward family home, the Green House, will both be revealed and interpreted. The walled garden will be levelled and a planting design scheme started. It will also be opened for public viewing. Improvements will also be made to access around the Temple Water by reinstating former pathways and steps; repairing drains; creating pockets of natural biodiversity; removing some inappropriate trees; pruning others, and planting new trees in locations based on early demesne maps. Enhanced interpretation will also be installed to enable everyone to share in the story of the Ward family and their grand designs. 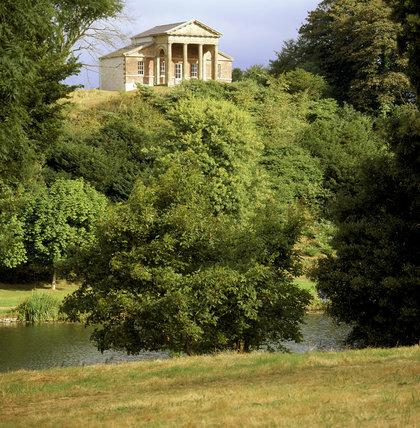 A team of National Trust specialists including curators, archaeologists, historic gardens advisers and interpretation designers will be available to provide advice and work together to bring the Temple Water back to the late 17th early 18th century design. The final picture will be a grand formal and unexpected statement in the midst of rolling landscape. Bangor arms courtesy of European Heraldry. The family of BARRETT-LENNARD originated in Essex. The name was an amalgam of the Barrett and Lennard families, after Richard Barrett took the name LENNARD in consideration of the manor of Bell House (Belhus) in Essex, bequeathed to him by Edward, 1st Baron Barrett of Newburgh. 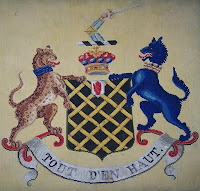 The surname was styled LENNARD-BARRETT until 1755, when Thomas, 17th Lord Dacre, transposed the order of the names. The Barrett-Lennards were absentee landlords of the Clones Estate, which originated in confiscated church lands. Prominent members of the family included Thomas Lennard, 1st Earl of Sussex, who, in 1674, married the thirteen-year-old Lady Anne FitzRoy (alias Palmer, the family name of the Earl of Castlemaine), natural daughter of CHARLES II and Lady Castlemaine, afterwards Duchess of Cleveland. The King and her mother spent the first night of the Restoration together and she was born nine months later. 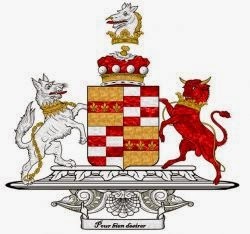 The King acknowledged her as his child and granted her the royal arms with the baton sinister. ANNE, 16th Baroness Dacre (1684-1755), younger daughter of the 1st Earl of Sussex, married thrice. THOMAS, 17th Baron (1717-86), who took a great interest in the management of his estates, manifested by the very considerable number of letters which remain from both his Norfolk and his Irish agents, giving him full accounts of all the details of their management. In 1740, Lord Dacre paid a visit to Ireland for the purpose of looking after his property. 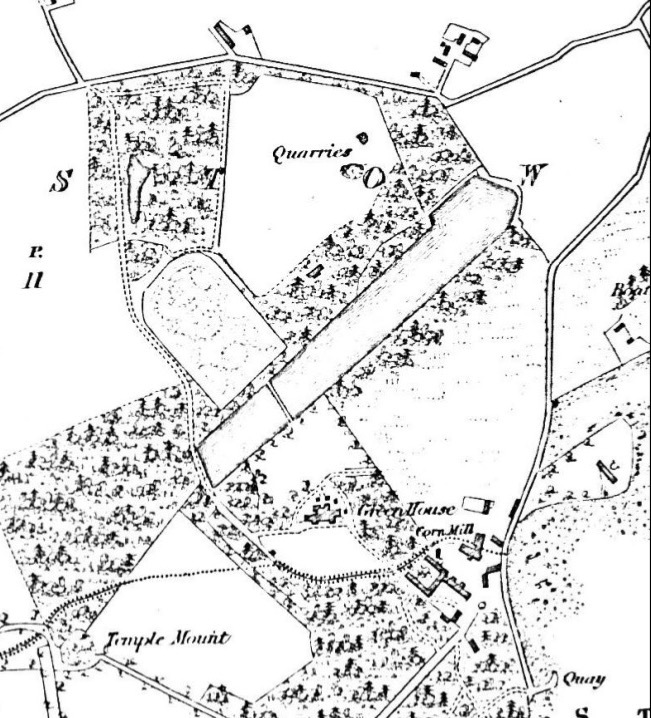 Merely 23 years of age, and recently married, he was greatly interested in his intended visit, and anxious to show his new bride his town of Clones and the considerable estates which he owned surrounding it. "only one parlour and three bedrooms with fireplaces, and three other little rooms without fireplaces or any furniture. In the cellar a hogshead of old French claret, very good, if not spoiled with this long frost." 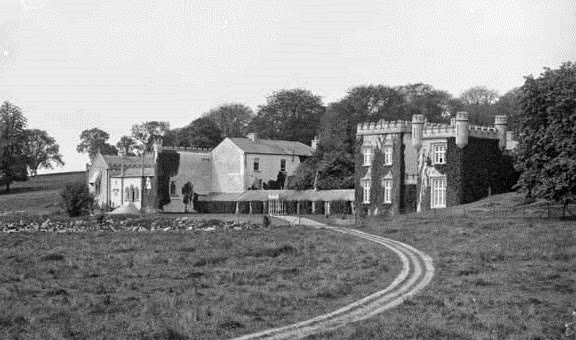 THE CASTLE, Clones, County Monaghan, was re-discovered in 2016. The Barrett-Lennard Papers are held at PRONI. 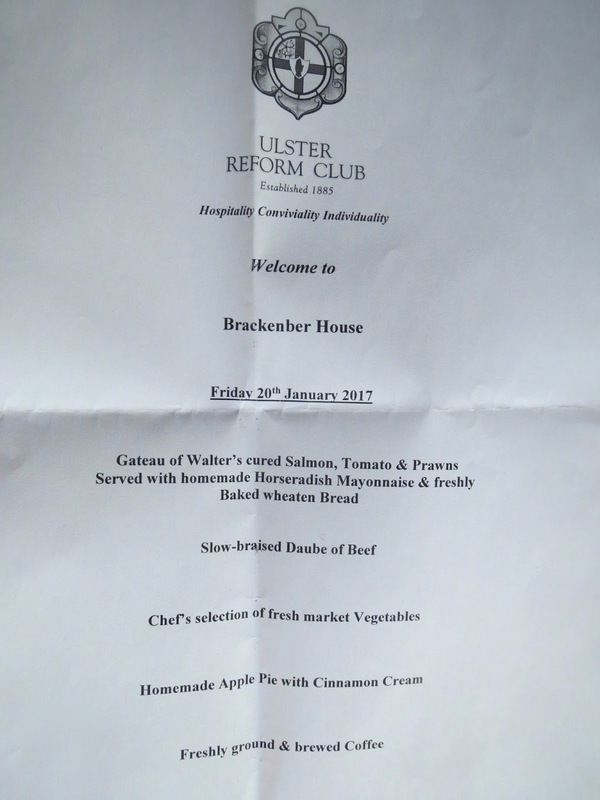 Last night (Friday, 20th January, 2017) I attended the annual reunion dinner of the Old Brackenbrian Association at the Ulster Reform Club, Belfast. 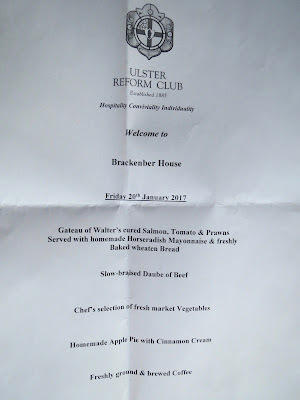 Brackenber House, my old prep school, was at Cleaver Avenue in Belfast. 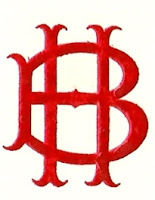 I was at Brackenber from about 1971 till 1973 or 74. Our dinner last night was in the former billiards-room on the top floor. The Reform Club is undoubtedly one of Belfast's most venerated institutions: heavy oak panelling; thick, opulent carpets; vaulted ceilings; decent plasterwork; leather armchairs. This is the last remaining Victorian gentlemen's club in the city, though of course it's open to both genders now. The Club used to have accommodation for members, though I think this ceased in the 1970s. There were about 58 of us there last night, a good turnout given that the old school was demolished perhaps thirty years ago. As usual the company was most enjoyable. It's always great to see Johnny Knox there (he endeavoured to teach me French at Campbell) and Jeff Dudgeon, MBE. I have never been disappointed yet by the dinners at the Reform Club, and last night was certainly no exception. We had Gateau of Walter's Cured Salmon, Tomato & Prawns served with home-made horseradish mayonnaise and freshly-baked wheaten-bread. Incidentally, for the benefit of readers, Walter Ewing is from the celebrated Ewing's fishmongers. The main course was slow-braised daube of beef with a selection of fresh market vegetables. Pudding, home-made apple pie with cinnamon cream. All very traditional and appropriate for the occasion. I happened to be seated beside Paul Bew (Lord Bew) and Ben Lowry of the Newsletter newspaper. Our speaker was Mike Brown, MVO, the Commissioner of London Transport. I had a good chat with him afterwards. We are all indebted to the unsung organizers of the annual dinner, including Gordon Harvey and Robert Curran. In November, 2016, I wrote an article about a visit to Mount Stewart, County Down, by Charles Villiers, Theresa Villiers and Jonathan Caine. Jonathan Caine has subsequently been in touch to apprise me of his elevation to the House of Lords. "Jonathan Michael Caine, Esquire, having been created Baron Caine, of Temple Newsam in the City of Leeds, was introduced and took the oath, supported by Lord Black of Brentwood and Lord Empey, and signed an undertaking to abide by the Code of Conduct." Lord Caine has sent me two photographs of his introduction. If we are being strictly precise, his formal style is "the Rt Hon the Lord Caine", informally "the Lord Caine"; or on legal documents "the Rt Hon Jonathan Michael Baron Caine". These days it's generally abbreviated to "Lord Caine" without the definite article. The style "Right Honourable" is accorded to all peers below the rank of marquess. It doesn't imply membership of the Privy Council in these instances (in which case the letters "PC" would be added after the title). Jonathan Caine read History at Leicester University, where his specialism was the Home Rule Crisis and the Anglo-Irish Treaty. He joined the Conservative Research Department in 1987, working in the office next to David Cameron. He joined the party's Northern Ireland desk in 1988, and between 1991-95 was a special adviser at the Northern Ireland Office - rejoining it in 2010. In 2008, Lord Caine stated that he was a Director at Bell Pottinger Public Affairs. 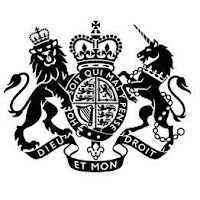 In 2014, he worked as special adviser to the Rt Hon Theresa Villiers MP, being described in the press as her "right-hand man". Jonathan Caine had also worked for the Rt Hon Owen Paterson MP, and was described by him as "one of the foremost experts on Northern Ireland". As of 2016, he had worked for no fewer than seven Secretaries of State for Northern Ireland. ALEXANDER HAMILTON, of Knock, County Dublin, and of Newtownhamilton, County Armagh, MP for Killyleagh, 1730-61, espoused Isabella, daughter of Robert Maxwell, of Finnebrogue, County Down, by Jane, daughter of the Rev Simon Chichester, Vicar of Belfast (eldest son of Henry Chichester, of Marwood, by Jane, daughter of the Rt Rev Robert Maxwell, Lord Bishop of Kilmore). He died in 1768, leaving four sons and three daughters, viz. 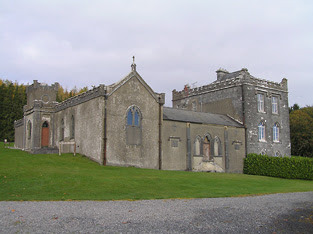 THE REV ALEXANDER CHETWOOD HAMILTON, Rector of Thomastown, County Kilkenny, married, in 1801, Eleanor, daughter and co-heir of THE REV SEWELL STUBBER, and assumed, in 1824, the surname of STUBBER in lieu of Hamilton, and the arms of Stubber only. Elinor Frances; Kathleen Elizabeth; Alice Maude; Mary Beatrice. MOYNE HOUSE, near Durrow, County Laois, is a five-bay two-storey house with dormer attic, built ca 1730. It has a pedimented central bay with a projecting porch. Moyne was renovated and extended about 1880, with two-bay, two-storey wings and a dormer attic. The house has a double-pitched and hipped slate roof, with rolled lead ridge tiles and limestone ashlar chimney-stacks. The roof is gabled; rubble limestone walls; a Venetian-style window opening to entrance bay and oculus to pediment. The house is set back from the main road in its own landscaped grounds. It has a stable complex, including two-storey rubble stone ranges, one of which was renovated about 1970 to accommodate residential use. Of its interior, the drawing-room is notable for its Adam-Revival ceiling; while the dining-room has a frieze of plasterwork in late 18th century style; and a carved wood chimney-piece in Elizabethan style. Moyne Polo Club, established in 1996, is affiliated to the Hurlingham Polo Association. A Midsummer Ball and one-day tournament is held in June; a two-day tournament on the penultimate weekend in July; and a tournament in August with the emphasis on junior polo. Moyne House became the Hamilton family home in the early part of the 19th century, when Robert Hamilton-Stubber (1803-63) moved there from Kilkenny. The house then descended via Robert Hamilton-Stubber (1846-1916) to Major Robert Hamilton-Stubber DSO (d 1963), who sold Moyne to his cousin, Hubert Charles Hamilton, in the 1920s; from whom the present branch of the family is descended. The Hamilton family still live at Moyne. JOHN BRYAN, of Kilkenny, was younger brother of James Bryan, of Bawnmore, and son of John Bryan, of Bawnmore (whose father, Lewis Bryan, had a grant from Thomas, Earl of Ormonde, of Whitewalls, alias Bawnmore, County Kilkenny, and died in 1568). Augusta Margaret Gwendaline, m Edward Joseph, 2nd Baron Bellew. The second surviving son was GEORGE LEOPOLD BELLEW BRYAN, of Jenkinstown. GEORGE LEOPOLD BRYAN JP DL (1828-80), of Jenkinstown, MP for County Kilkenny, High Sheriff, 1852, who married, in 1849, the Lady Elizabeth Georgina Conyngham, daughter of Francis Nathaniel, 2nd Marquess Conyngham KP, and had one daughter, Mary Margaret Frances, who died in 1872. GEORGE LEOPOLD BELLEW-BRYAN JP DL, 4TH BARON BELLEW (1857-1935), of Jenkinstown, Lord-Lieutenant of County Louth, 1898-1911, who assumed the surname of BRYAN in lieu of BELLEW, by royal licence dated 1880. JENKINSTOWN HOUSE, Ballyragget, County Kilkenny, was an early 19th century house in "pasteboard Gothic", following the traditional Palladian plan of a centre block joined to wings by single-storey links. The house was built for Major George Bryan to the design of William Robertson. There is a two-storey centre block; a two-storey projecting porch crowned with a battlemented gable and pinnacles; two-storey end towers with quatrefoil windows. Later in the 19th century, one of the wings was re-built with corbelled bartizans; and the centre block was demolished apart from one of its walls. The 4th Lord Bellew lived in one wing of the house; his staff in the other. By the 1930s, the house had become somewhat dilapidated. THOMAS BARTON (1553-1626), of Norwich, who is said to have accompanied the Earl of Essex's army, in 1599, to that kingdom. He was one of the first burgesses of Enniskillen, County Fermanagh. 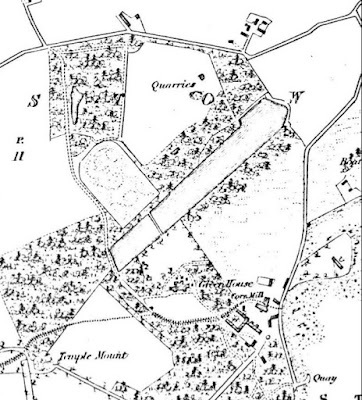 In 1610, he obtained a grant of land comprising a district called Druminshin and Necarne, County Fermanagh. Some of these lands were exchanged by him for others in the neighbourhood still in the possession of the elder branch of the family. WILLIAM, of whom we treat. THOMAS BARTON (1694-1780), established the house of business at Bordeaux, France, 1725, and acquired a considerable fortune. 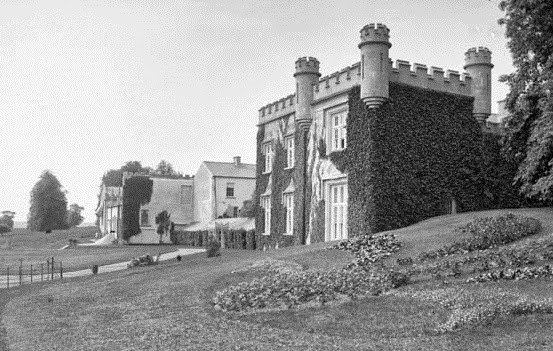 He purchased the estate of Grove, County Tipperary, in 1752. This gentleman established the famous vintners Barton & Guestier. HUGH BARTON (1766-1854), who, by his own energy, industry, and activity, acquired at Bordeaux a very large fortune, which he invested in the purchase of the Straffan estate and other lands in Ireland in 1831, and also in the purchase of the Château Langoa, and a portion of the adjacent property of Leoville, both in the parish of St Julien Medoc, near Bordeaux. During the reign of terror, in 1793-4, he was imprisoned as an alien, but by the connivance of his wife, daughter of a naturalised Frenchman of Scottish origin, he effected his escape to Ireland. During his absence the business in Bordeaux was managed by Daniel Guestier, with whom he entered into partnership in 1802. In 1840, he served as High Sheriff of Kildare. Susan; Anna; Grace; Isabella; Susan Elizabeth; Charlotte. Mary Esther Isabella; Anna Susan Frederica; Isabel Charlotte; Alice Catherine Harriet. HUGH LYNEDOCH BARTON JP DL (1824-99), of Straffan House, High Sheriff, 1861, Major, Kildare Rifles, former Lieutenant, 6th Inniskillings, wedded, in 1855, the Hon Anna Emily Massey, eldest daughter of Eyre, 3rd Lord Clarina. 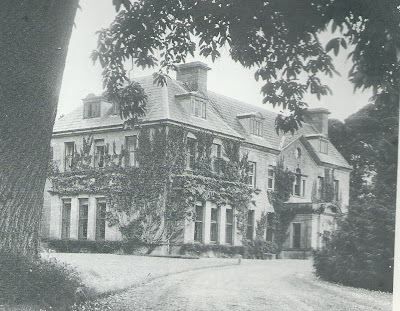 Captain Barton sold Straffan House in 1949. Thereafter he lived at The Glebe, Straffan. He was President, Royal Dublin Society, 1966-68. In 1976, Captain Barton lived at 18 Waltham Terrace, Blackrock, County Dublin. Derick Barton sold Straffan House to the motorcycle manufacturer, John Ellis, for £15,000. Other owners in the interim periods between the Barton family and the current owner included: Car importer Steven O’Flaherty (1960); the film producer responsible for the James Bond film Thunderball, Kevin McClory (1973); Iranian Air Force founder, Nader Jahanbani (1977) who was executed around the time of the downfall of the Shah Reza Pahlavi government; Patrick Gallagher (1979); and the property magnate Alan Ferguson (1981). STRAFFAN HOUSE, near Straffan, County Kildare, is a stately 19th century mansion with the appearance of a French-Italianate château. The main block is of two storeys with an attic of pedimented dormers in a mansard roof. There is a seven-bay entrance front, the centre bay breaking forward, with a tripartite window above a single-storey, balustraded, Corinthian portico. The main block is prolonged at one side by a lower, two-storey wing, from which rises a lofty, slender campanile tower, with two tiers of open belvederes. The garden was formal, with an elaborate Victorian fountain. 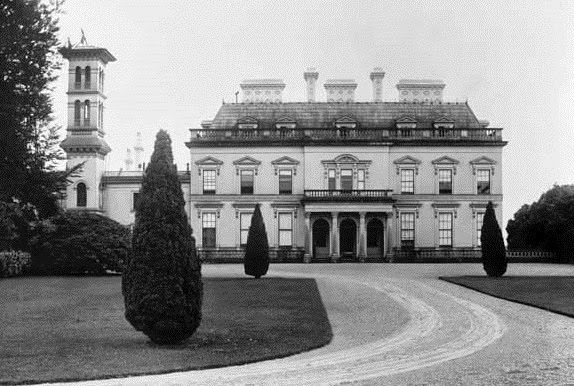 The mansion house was reduced in size about 1937 by Captain Barton, the four bays of the main block furthest from the wing being demolished. 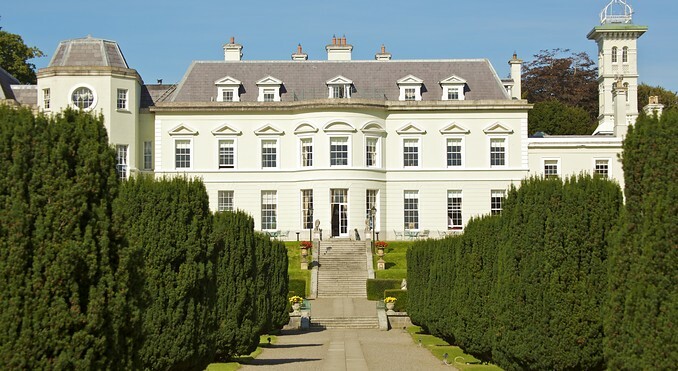 IN 2005, Sir Michael Smurfit KBE (with Gerry Gannon) purchased Straffan estate. 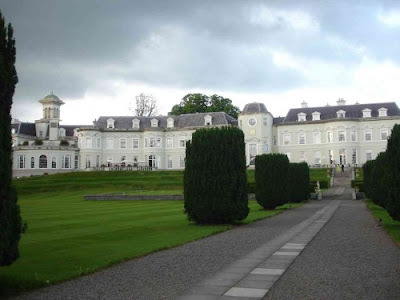 It was transformed into a luxury hotel and leisure complex, the Kildare Hotel & Golf Club, known simply as The K Club. Sir Michael is now the sole owner. Under Sir Michael's ownership, Straffan House has in effect been doubled in size, using a granite porch from Ballynegall in County Westmeath, to fuse the two sides together. Not only has a de luxe hotel been created, but it has also been furnished with important works of art.